You want to remodel your home with tile flooring. For hundreds of choices in flooring your house or place of business, turn to our locally owned and operated store. In business since 1974, we have an expansive showroom filled with brand-name selections of premium flooring in a multitude of styles, colors, shapes, and sizes. To help you choose the tile floor for your space, rely on our design and sales professionals. Our staff consists of flooring experts who have comprehensive product knowledge, as well as training and experience in decorating with tile. Let us help you find tile that pleases you and schedule professional tile flooring installation for your home. Our local store is part of a buying consortium of 500 stores around the country. As we purchase flooring in a buying block, we are able to acquire the top brands, selections, and prices, and make sure that our customers benefit. Manufacturers put their names on brands to let customers know these floor coverings offer quality, style, and performance. A couple of our most popular brands of tile flooring include Star Values™ and Floorcraft™. Work with our flooring experts for the tile that suits your decorating preferences and lifestyle requirements. We ask you questions about what you would like so we can show you samples of flooring options for your home or place of business. Browse through our well-organized flooring showroom to see stunning collections of ceramic, porcelain, and slate tile. Ask our experts to explain the merits of each and show you samples that complement your decorating style. One of the reasons our local store is so successful is that we match your preferences and requirements to flooring in the type, style, and color that is perfect for you. Ceramic and porcelain tile are both stylish and durable floors for any room or area in your home. They both come from clay that is kiln-fired. As you can imagine, this results in tile that is not only strong, but resistant to fire, water, and frost. 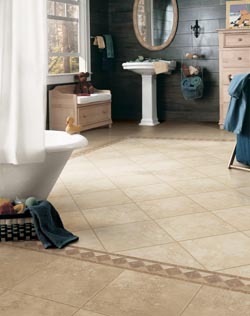 Both ceramic and porcelain tile are great investments that increase the value of your property. For all their similarities, these two tiles have their differences. Ceramic tile flooring offers elegance and refinement with a slightly more cost-effective price tag than porcelain, while porcelain provides a modern presentation that flatters all decorating styles. Quarried from natural stone, slate tile offers an earthy palette of colors that includes blue, green, gray, rust, and gold. Each tile is different, which gives your slate flooring a look that is unique and distinctive. With the strength of stone, slate tile provides your home with long-lasting beauty. You have finally chosen the new flooring for your home, so sit back and let our installation specialists put your tile in place. Our professionals have years of skill and knowledge in this craft. We start by preparing the subfloor properly and then laying mortar and tiles carefully, making sure they adhere. We separate each tile with grout for protection. With our professional installation, your tile flooring graces your home for many years to come. Do you have questions about tile flooring? Complete our online contact form to learn more about our wonderful selection of ceramic, porcelain, and slate tile for customers in Raleigh, Wake Forest, Rolesville, Youngsville, and Louisburg, North Carolina, and the surrounding areas.